Hiro Fine Art is interested in purchasing artwork by Gilbert Munger. Gilbert Munger was born on 1837 in Madison, Connecticut. Munger has an incredible amount of interest in art at an early age. His family sent him to Washington D.C. where at the young age of 13 he became an apprentice engraver, working under William Dougal. Munger worked there for 10 years and did several projects for the United States government. Gilbert Munger became friends with several other artists in town and began to teach himself how to draw and paint. During the Civil War, Munger was an engineer in the Union Army. When the war ended, he moved to New York City to begin his career as a full time artist. In 1866, Gilbert Munger had a studio in New York City and also spent time in St. Paul, Minnesota to be with his brother who settled there. He exhibited his paintings at the National Academy of Design exhibition of 1866 and began to get recognition as an artist. In 1869, Munger traveled out west to Utah to be an artist with Clarence King’s Geological Exploration of the 40th Parallel. Munger enjoyed his travels out west and continued to paint the beautiful landscapes and had several chromolithographs published in King’s Systematic Geology book. He painted several landmarks in California including Yosemite and the Sierra Nevada mountains and settled in San Francisco from 1860 to 1873. Munger returned to New York City and sailed to Europe, settling in London, England. 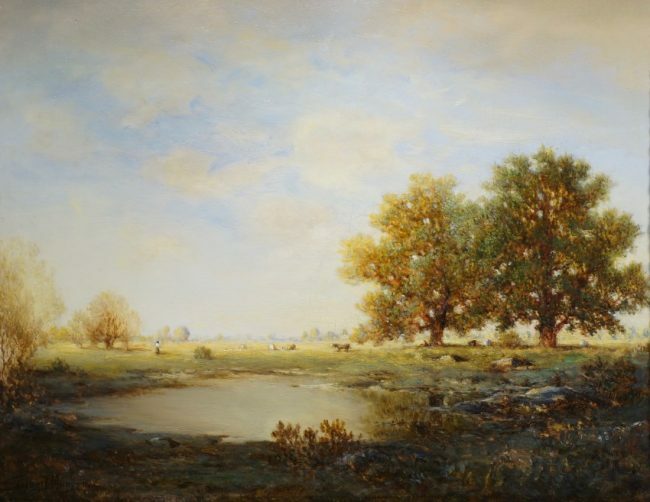 He spent about 8 years in London before establishing a studio in Barbizon, France. His paintings were critically acclaimed by European collectors and press. Munger received several medals from European governments. When he returned to the US in 1893, he incorporated many of the European aesthetics he learned in Europe to his art.